The Prompt Book is the master copy of the script or score, containing all the actor moves and technical cues, and is used by the deputy stage manager to run rehearsals and later, control the performance. It’s sometimes known as the ‘book’, Prompt Copy or Prompt Script. 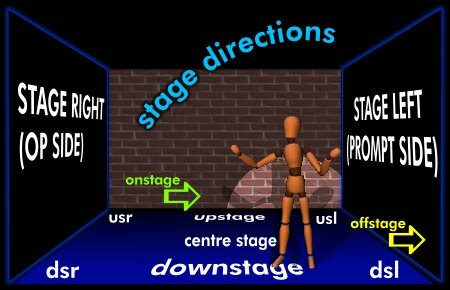 The member of stage management (often the DSM) cueing the show is said to be ‘On the Book’. (e.g. ‘Clare’s on the book for the next show’). As well as the script and/or score of the show, the prompt book also contains contact lists for all concerned with the production, information about the venue(s), show reports, local amenities, emergency procedures and any other information that may be needed during the run of the show. It’s rightly known as the production ‘bible’. The book is usually laid out so that the script is on one side of a folder, and the cues are on the opposite side, with a line between the cue word / line, and the cue itself. Left-handed DSMs may prefer the cue page to be on the left of the folder. Most prefer it to be on the right, as below. If professional practice is followed, the Prompt Book is used throughout the production / rehearsal process for the DSM / SM to keep notes of everything relevant to the show. 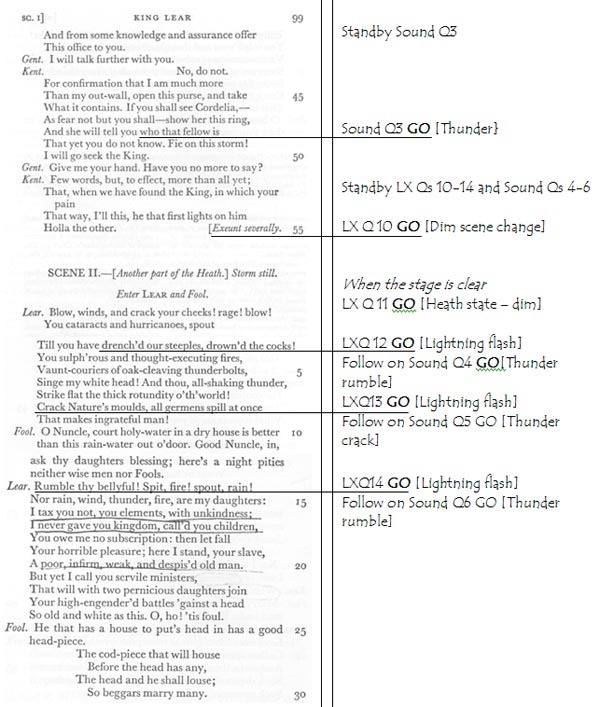 Some SMs like to use a column-based layout with the script on the left, and (for the right-handed) columns breaking up the right hand page, for notes about blocking, lighting, sound, props, set and followspot. (The columns used depend on the complexity of the show). This type of layout means it’s easy to see which notes relate to which tech department, and which can be ignored if you’re calling cues. The notes should be written in pencil so that they can be erased & replaced with more detail as the production progresses. All actor movements should be noted in such a way that anyone can read and understand them. There’s a standard form of notation used in the prompt book. A plan view of the set can be incorporated onto each page in the book, so that positions can be marked on that too. For a musical, the DSM has a personal choice to either use the lyrics / libretto, or to use the full musical score. The decision depends on how complex the music is, and whether the lighting designer has cues that are on specific beats (rather than on specific words). An opera or operetta with very little spoken dialogue really must be cued from the full score. Depending on copyright restrictions on the score, you could scan parts of the score and insert them into the script where needed (for example, the beginning and end of a song, as long as there are no cues within the song). Another option is to insert dance counts into the script, to give you the correct beat for a cue. The Royal Opera House ‘Opera Machine’ resource contains an interactive prompt book for an entire opera, which you can follow throughout the performance. The New York Public Library has digitised the Cue Book for West Side Story from the original Broadway production in 1957. Warn cues are the US equivalent of Standby cues. Any non-standard movement-based piece requires a different approach. There’s no score to follow, and there may not be any text to follow. The document linked below is a sample of a movement piece, which contains all the required information about the piece. It’s important that there’s a sense of timings, even if there’s no soundtrack, so that the person cueing the show has an idea of when to prepare for a cueing sequence.